With all the recent industry fuss over ad trackers, I got responsible and reinstalled Ghostery on my browser, and I activated many of its blockers. This has had several interesting effects. One is that active tracker blocking is invasive in its own way. I’m creating hardships in my own browsing experience that privacy hard-liners don’t mention. If I block optimization schemes too aggressively, I can break essential functions once in awhile, including a site I manage at work whose navigation is mboxed for Adobe Test & Target tracking. Visiting Monoprice with Ghostery on, I discovered today, gnarls their top nav, too, and their search box disappears. And so on. Another is the level of awareness that Ghostery creates in the end-user. I know about ad networks and trackers, of course I do, I’ve been in this industry 20 years now. But I didn’t actively think about them all that often. Then I turned on Ghostery, and I visited copypastecharacter.com, a humble little type-geek website that allows for quick unicode character finding. And in finding my ✔, I also found 87 trackers. Eighty-seven! I no longer wonder what purpose the site serves beyond its builders’ nerdy satisfaction: it’s a robust ad engine. As are many other websites for whom users unwittingly expose their usage details. The full list, behind the jump, for posterity’s sake. Wikipedia is a part of everyday life for most everyone who uses the web. I personally cross-reference or poke around Wikipedia almost every day—93 times in the past 30 days alone, per my browser history. Millions of people are similar to me, if not more so. Having become something of an institution, Wikipedia now faces a long-term struggle for its fiscal and editorial health. Most immediate is the need for cash flow. Wikipedia’s frequent pledge drives on its website do a good job of highlighting the organization’s monetary needs (and plenty of readers, thankfully, are listening). More easily overlooked is its slowly dwindling volunteer workforce, the thousands of people who keep Wikipedia updated and objective. Wikipedia is only as strong as its contributors and editors, a team that peaked several years ago. 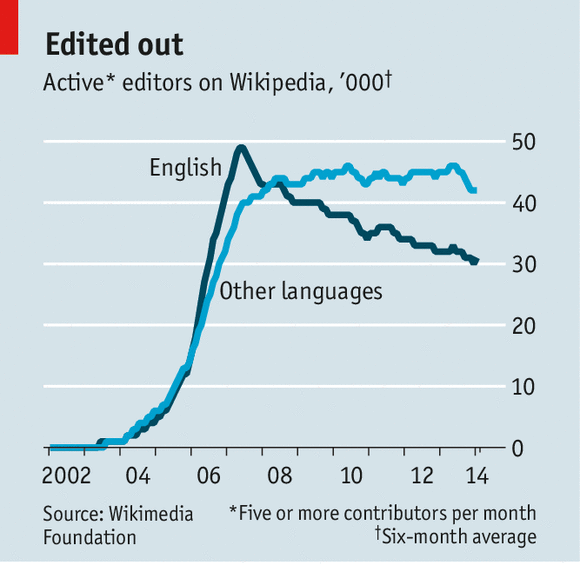 The Economist did a great deep-dive into Wikipedia’s state of affairs this spring. It pointed out that the number of English-language editors on the site has dropped steadily for nearly a decade, to 30,000 volunteers this year, down from 50,000 in its heyday. That sounds like a big staff, but with nearly two billion pages to curate, and an almost entirely unpaid team, the math quickly gets sour. Right around the time of the Economist article, I found myself disgruntled at yet another article speaking in the present tense about 2011. So, after a decade of lurking and leeching, I signed up for a Wikipedia account. And when I see a line like, “The band is slated to appear on the first week of Jimmy Fallon’s new talk show,” my annoyance now turns to utility, as I am empowered to fix that sentence, and a tiny bit responsible, too. As a longtime writer, editor and grammar hound it’s a no-brainer for me to pitch in. I’ve only updated a handful of articles thus far, but I am quick to hit the Edit button when I see outdated or inaccurate text, most recently this morning, updating the status of a canceled program. Making updates to Wikipedia is easy, it’s satisfying, and it ensures that the site will continue to be a useful resource. Wikipedia, of course, has been running on this model since its inception. But too many people, like me, take the labor behind the site for granted. My own contribution ultimately will be small, but it will be a contribution nonetheless. Please consider doing the same. Even occasional edits help keep the world’s encyclopedia appropriately encyclopedic. While Uber is coming under a lot of fire (including from me) on its surge pricing, Wired’s latest piece on Uber’s situation clarified a point that is worth highlighting. Surge pricing, according to Uber, is intended to stimulate supply and curb demand to ensure the two match. Otherwise, the logic goes, would-be riders are left stranded without a car. Last month, during the height of the backlash against Uber over fares reported at seven times the usual during a New York snowstorm, Kalanick told WIRED that the bad publicity his company faced over surge pricing would pale compared to the impact of Uber not being able to offer a ride at all. This is what Uber and CEO Travis Kalanick are doing with surge pricing: they’re getting the masses to back off. Anyone who’s encountered a surge pricing screen on Uber in the past few months has done so while trying to reserve a car that’s only a few minutes away, as usual. That car is available because of surge pricing—specifically, because higher prices get fewer people to grab at finite inventory, maintaining a decent supply. Of course, Kalanick can’t say that out loud, so he talks at length about bringing more cars on the road. Yet that’s only part of the story, and he’s been challenged on whether surge pricing really aids supply. In truth, what surge pricing really accomplishes is throttling demand. And this makes sense: if an Uber user tried to call for a car in bad weather, and the nearest vehicle was 27 minutes away rather than 6, or not available at all, what would the response be? Customers would give up on the service for lack of reliability, and return to hailing cabs and calling car services, which are equally imperfect but entrenched in society. Uber is not, at least not yet. To the company, “Uber doesn’t work” is a worse fate than “Uber is sometimes too expensive.” So premium fares continue. Uber has decided that supply is the most important link in its chain, and is using surge pricing to maintain it. Which, while not the most satisfying thing to Uber users, is a rather logical approach. Update: this wonderfully in-depth look at Uber’s economic and business decisions sheds additional light on the subject. The bottom line is that the only real alternative to dynamic pricing is a ton of customers staring at screens that read “No Cars Available.” This is the fact that is least appreciated by Uber’s critics. When I launched the Ideapad, on November 1, 1998, it was rather ugly, it cribbed off others, and it didn’t even have its own directory. * But what it was, it miraculously still is: a home online for me to publish independently, everything from mundane thoughts on shopping and puppies to important perspectives on usability, digital life, the Internet business and my own evolution. Fifteen years on, the Ideapad is one of the world’s oldest and longest-running online blogs, which I take less with surprise or pride so much as contentedness. The good ol’ ‘Pad is still here. I’ve gone through a couple of phases where I almost stopped writing—once, I even blogged about not blogging, and promptly lost half my audience–and in retrospect the best thing about this page is its consistency. I’ve had more than my share of reminiscences in this space over the past few months, so it’s best to look forward here, to many more years of satisfying self-publishing. Thanks for reading. * My incredulous kudos go out to Net Access, my old web host, for fighting link rot and keeping my old directory live, for more than a decade of uptime since I deactivated my account. I’m not even sure they have individual user accounts anymore, but my old pages are still live. The World Wide Web purist in me is very appreciative of this.